There has been concern over the adverse ecotoxicological effects of atrazine and endosulfan on microalgae. This study aimed to assess the effects of these two widely used pesticides on growth, pigmentation, and oxidative response of microalgal isolates from a farmland and a eutrophic lake in Malaysia, in comparison with the model species Pseudokirchneriella subcapitata. Results showed that the microalgae originated from the eutrophic lake were generally more sensitive to the pesticides than those from the farmland. The microalgae were more sensitive to atrazine (EC50 = 43.07–> 5000 μg L−1) than endosulfan (EC50 = 1.51–> 50 mg L−1). Amongst the microalgae, Scenedesmus arcuatus was most sensitive to atrazine (EC50 = 43.07 μg L−1) while Chlorella sp. 1 was most sensitive to endosulfan (EC50 = 1.51 mg L−1). Microalgae from the farmland were generally very tolerant to endosulfan (EC50 > 50 mg L−1). Photosynthetic pigment content (pg cell−1) increased in S. arcuatus after exposure to atrazine while the content decreased in most of the microalgae after exposure to endosulfan. Oxidative response to the pesticides varied amongst the tested microalgae and time point measured. Both ROS levels and lipid peroxidation decreased in Chlorella sp. 5 after exposure to atrazine at 96 h compared to 48 h. In S. arcuatus, there was no pronounced increase in SOD and catalase activities despite the increase in ROS and lipid peroxidation after exposure to atrazine. 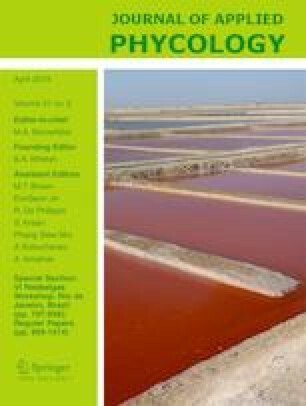 Indigenous microalgae such as S. arcuatus could be a useful bioassay organism for toxicity testing of the pesticides while tolerant species from the farmland could be useful for bioremediation of endosulfan contamination. The online version of this article ( https://doi.org/10.1007/s10811-019-01800-1) contains supplementary material, which is available to authorized users. The first author would like to express her appreciation to MOE for the MyBrain Scholarship in supporting her doctoral study. This research project received funding support from the Fundamental Research Grant Scheme (FRGS) from the Ministry of Education (MOE), Malaysia (FRGS/2/2014/STWN01/IMU/01/1).